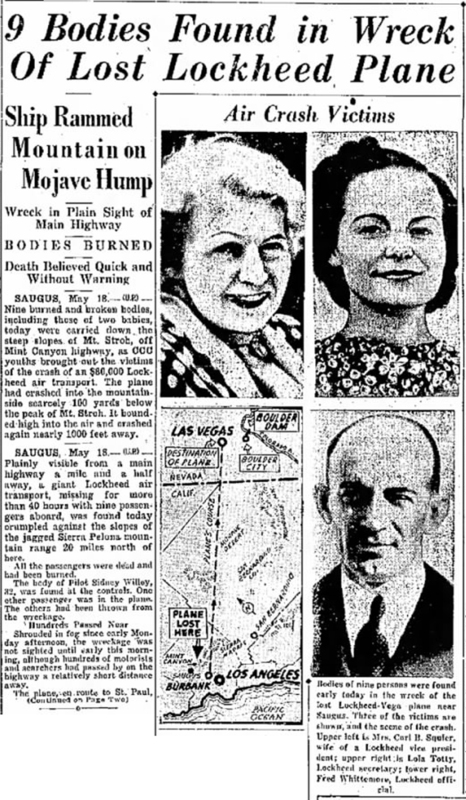 SCVHistory.com | Agua Dulce | 9 Bodies Found in Wreck of Lost Lockheed Plane, 5-16-1938. 9 Bodies Found in Wreck of Lost Lockheed Plane. News reports | Incident May 16, 1938. (Click to enlarge.) Original caption: Bodies of nine persons were found early today in the wreck of the lost Lockheed-Vega plane near Saugus. Three of the victims are shown, and the scene of the crash. Upper left is Mrs. Carl B. Squier, wife of a Lockheed vice president; upper right is Lola Totty, Lockheed secretary; lower right, Fred Whittemore, Lockheed official. Ship Rammed Mountain on Mojave Hump. Wreck in Plain Sight of Main Highway. Death Believed Quick and Without Warning. San Mateo Times | Wednesday, May 18, 1938. Saugus, May 18 — (U.P.) — Nine burned and broken bodies, including those of two babies, today were carried down the steep slopes of Mt. Stroh, off Mint Canyon highway, as CCC youths brought out the victims of the crash of an $80,000 Lockheed air transport. The plane had crashed into the mountainside scarcely 100 yards below the peak of Mt. Stroh. It bounded high into the air and crashed again nearly 1,000 feet away. Saugus, May 18 — (U.P.) — Plainly visible from a main highway a mile and a half away, a giant Lockheed air transport, missing for more than 40 hours with nine passengers aboard, was found today crumpled against the slopes of the jagged Sierra Pelona mountain range 20 miles north of here. All the passengers were dead and had been burned. The body of Pilot Sidney Willey, 32, was found at the controls. One other passenger was in the plane. The others had been thrown from the wreckage. Shrouded in fog since early Monday afternoon, the wreckage was not sighted until early this morning, although hundreds of motorists and searchers had passed by on the highway a relatively short distance away. The plane, en route to St. Paul, Minn., via Las Vegas, Nev., left Union air terminal, in Burbank, at 1:40 p.m. Monday, and encountered heavy fog and rain-laden clouds in crossing the mountains to the Mojave desert. It struck a high hog's back of the Pelona range at an altitude of 3,300 feet, burst into flames, then bounced and crashed 500 yards away. Pieces of burned wreckage from the first point of impact indicated the ship caught fire with the first crash. The clock on the instrument panel of the plane had stopped at 2:07 p.m., indicating the crash occurred twenty-seven minutes after the takeoff. Joe Merriott, department of air commerce inspector, after inspecting the wreckage, said motor trouble had not caused the accident. The slope on which the plane crashed is covered with brush and boulders. One of the motors of the $80,000 twin-motored monoplane was torn loose. It slid 100 feet down the slope and cut a deep gash in the mountainside. This scar and the plane's wreckage were plainly visible from Mint Canyon highway. The plane carried enough fuel for a seven-hour flight. The ground around the first point of impact was burned and fires from spilled gasoline had burned away the brush from this point to the place where the ship finally was demolished. Pilot Willey had made no radio contact with the Burbank airport after the takeoff. Lockheed officials said this would indicate that he crashed suddenly, without warning. They said if he had been in trouble he would have notified the Union air terminal and cruised around before the crash. The plane was flying due north on its regular course at the time of the crash. Walter Peterson, a Spade canon rancher, discovered the missing plane at 5:30 a.m. today as he was going along the Mint canyon highway. He immediately notified authorities. Immediately after reaching the wreck, Capt. Claude Morgan of the sheriff's aerial squadron and Coroner F.A. Nance began assembling horses from nearby ranches to bring out the bodies of the three men, four women, and two babies. Ambulances were sent up the Mint canyon highway and broke their way through the heavy brush of the hills to a point within a few hundred yards of the wreckage. The bodies will be taken to the Noble & Pasehall morgues in San Fernando. Henry W. Salisbury, 20, engineer of the Northwest Air Lines, St. Paul, Minn. Pilot Sidney Willey, 32, Burbank. Lolla Totty, 26, Glendale, Lockheed secretary. Mrs. Carl Squier, 34, North Hollywood, wife of a Lockheed vice president. Evelyn Dingle, 22, St. Paul, a Northwest Airlines secretary. Fred Whittemore, 42 , St. Paul, in charge of operations of the Northwest Airlines, and co-pilot. Mrs. Henry W. Salisbury, 25. Judith Salisbury, 2½ months, her daughter. Richard Salisbury, 3, her son. The body of one of the Salisbury babies was found in a clump of brush about a hundred feed from the wreckage by "Pete," pet dog of Mary Kahler, 16, of Mint canyon. Captain Morgan said he believed all the passengers had been killed by the shock of the crash and were not burned seriously. Federal and county authorities, aided by Lockheed officials, moved at once for an official inquiry in an effort to determine the cause of the disaster. Members of the sheriff's mounted posse were ordered to the scene as hundreds of automobiles carrying sightseers converged on Mint canyon and kept up an unbroken procession along the highway. Scores of other persons trudged afoot into the brush land and up the mountainside to the wreckage.